Fishing Friends – one of my old fishing pals, George Watson and I just came back from three days of fishing on the Main SW Miramichi at Campbell’s and Kennan’s Pool in Blackville, New Brunswick. As they say in the U.K. we had “no joy.” That is we landed no salmon, but we did come very close. On Tuesday George had a good roll from a salmon down in the bottom of the pool off Papa’s Rock. The fish did not take the fly and would not come back for another look. It had probably moved on as they so often do at this time of year. He also had a deep roll from another fish on Thursday morning that was lying beside a big rock, just below the wires, right in the center of the pool. After working their way down the pool Jason Curtis took George to another spot further up river. I decided to make a new pass down the pool from the top. Since they had told me about the fish that George rolled I carefully covered those lies again just to see if the fish might still be there, and perhaps had changed its mind about flies… It was still there, and it had changed its mind, but this time instead of rolling at my #4 Black Ghost it jumped clear out of the water a few seconds after the fly went past. Clearly the fish was agitated by the fly, but not in a way that caused it to strike. Early in the evening on Wednesday – day in day out I think of the time from 5:00 to 7:00 PM as the single most productive afternoon time to be fishing on our section of the Miramichi, and it was exactly 6:00 PM – I made about my 500th cast of the day when to my surprise I received a strong pull on the line. The drag was instantly spinning, and out in what we call “the center lies” a mid-teen sized salmon shot out of the water only to come unhooked from my #4 Silver Rat a few seconds later. With the good luck I have already had in Scotland and Russia in 2017 I’m not going to feel too sorry for myself, but I sure would have liked to have brought that salmon to the net and been on board for the year on the Miramichi! Apart from this we heard about an angler who caught two at Quarryville on Monday evening, that Maine doctor Marty Vickers had caught a nice salmon across from the Hershey Pool a couple of miles upriver from Campbell’s, and that Country Haven had gotten one and also seen a few on Wed. morning. 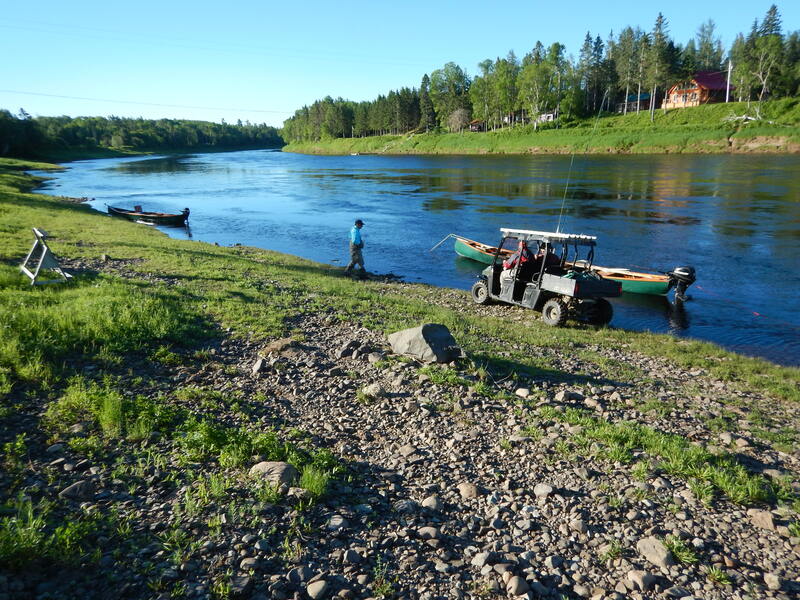 June is always a bit of a crap shoot on the Miramichi, and the earlier in the month the less predictable it is, but for sure the games are under way. A different sort of season – I’m not sure whether it is the cold spring that we had – though I can’t really see what else would be the cause – but the timing of some natural things is a bit out of whack along the Miramichi. For instance, we are normally witnessing heavy aquatic insect hatches by now, and that is just not happening yet. We also see turtles crawling around the banks and burying their eggs. Again, this has not happened yet. Normally the dozen and a half swallow boxes that I have set around the Campbell’s Pool grounds are filled more or less to capacity with nesting swallows, and there is always a nesting pair of bluebirds in the vicinity. This year I counted less than half the normal swallows, and I saw no bluebirds. My impression also was that the normal morning din of bird song was a bit hushed. I would guess that many song birds decided to nest a bit further south this year, but I can’t be sure. The numbers of swallows nesting in my boxes in Falmouth, Maine seem to be a bit up this year. That is certainly not a scientific measurement, but the apparent increase in Falmouth and decrease in Blackville is interesting. Also, while the shad run seems to be quite strong and a bit early, the gasperaux – river herring – run seem a little late. Also of note and concern was that striped bass were seen last week by knowledgeable people up in the Main Southwest Miramichi above Blackville village exhibiting spawning behavior. I assume that the MSWM is not really suitable striped bass spawning material or they would already be established there, but still this is the first time that I have heard of them trying to spawn. We did catch one tiny bass this trip, and getting one or two in early and mid-June is not at all unusual. Certainly there did not appear that there were very many stripers in our area at this time. Water conditions are also a little unusual for the 15th of June. Normally the river is running in the 1.5 meter range. That height limits wading and causes the fish to move along the banks. We were down to .88 meters when I left. That is a great summer height for the river and allows wading everywhere. It also causes the fish to move upriver through the heart of the pool where I believe they are more likely to take up a lie. It is fine, but again, it is unusual. The Northwest Miramichi, I heard, has much lower water levels, and but that can change with a good storm. In fact as I write this I see that the NW is covered with a good patch of rain this morning. 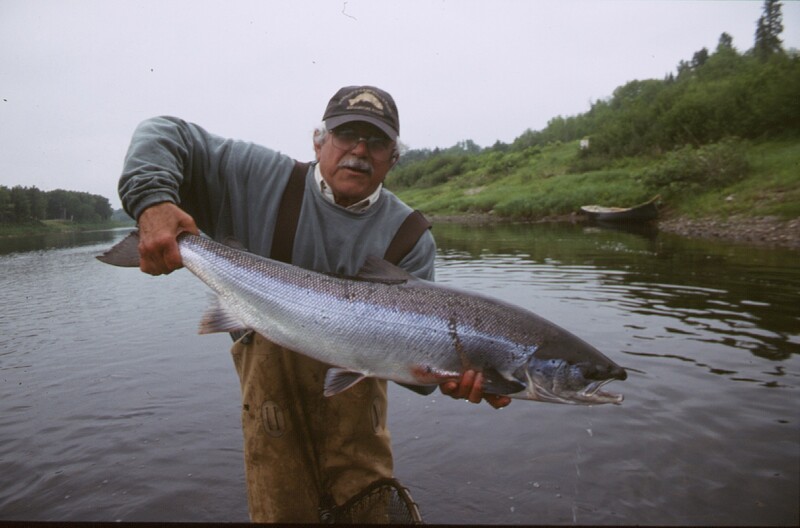 My best ever June Miramichi salmon was caught in 2004 on a #6 Black Ghost under water conditions similar to this year. I’m headed back up on Monday and will keep you posted. One thing is highly likely, and that is that with a forecast that currently includes no big rain the #2, and #4 flies in my fly box will be making way for smaller, more summer sized versions. Reports on the Gaspe Rivers from the Atlantic Salmon Federation seem to be upbeat about the number of salmon coming from that area compared to the last couple of years. They are always a bit earlier there than we are anyway, so we’ll see what develops. ← Russian Atlantic Salmon Fishing – A Cold Beginning! Miramichi Info. Mac – I see that the Miramichi Salmon Club face book page has a picture from last weekend of a salmon being released. Hopefully this rainy weather will spur the early run on a bit. Best of luck, and please let me know how you do. My buddy and I fished the Lake Branch of the Grand Cascapedia for 3 days and the Petit Cascapedia for 2 this past week. We hooked only 4 salmon and I landed one of 11 lbs. Water was at “summer” levels and with the very high levels of early spring the upper pools were fishing better than the lower pools on the Grand which is different than most years. There were quite a few fish being caught for June including one of 38 lbs! I see some rain in the forecast and it will be welcome to get the salmon moving for my week on the Restigouche in mid July. Tight lines. Thanks for the report Terry. Aye Pat, our big problem is hooks. We are required to use barbless singles. if we could still use doubles over here we would certainly land a few more. Heading to Upper Blackville for the week ,have heard a few fish are in the system .I will send you some pictures . Thanks John, best of luck. I’ll be back up there Monday night myself. I concur with your weather and wildlife observations. We haven’t had any major hatches here on the Meduxnekeag which disturbs me a bit. I normally see rising trout from the last week of May through the end of June on the river but this year seems different. Water is low and cold for this time of year. On another note, both of my swallow boxes are full and one of the nests has already fledged. Kent – mid June is remarkably early for the swallows to fledge. I had bluebirds here in Maine one year that nested in mid March. There were quite a few freezing nights and I thought surely they would all die, but they didn’t. By the end of April they were working on a second brood. It has never happened nearly that early since then.